If you are thinking about cycling the Via Francigena with CaminoWays.com, we have prepared this useful post answering all your questions about your new best friend: your bike! You have decided to cycle the Via Francigena, you have booked your self-guided holiday and you are now wondering how it will work. We recommend you cycle the Via Francigena only if you have some experience as a cyclist and are familiar with essential bike maintenance (how to change a tyre for example and basic bike repairs and assembly). When you arrive at your first hotel, your bike should be there waiting for you, ready for the following day: your first day cycling. The bike will be neatly packed in a box so the handlebar needs to be straightened and the pedals need to be attached. It is very important that you check the bike before you start your journey, making sure everything is working properly. If you think there is something not quite right, let us know so your bike can get replaced and avoid trouble on your way (in a way, it is similar to renting a car). Once you finish your cycle, the bike will be collected at your hotel. If mid-tour, you decide you don’t need some of the bike accessories (pannier, etc…), make sure to attach them to your luggage so it can be transferred easily (avoiding additional charges and risk of losing the equipment). Do not leave pedals or any other bike accessories supplied behind in your hotel, as you will be charged for loss or damage of equipment. Please note at CaminoWays.com we can provide bike rental if you are cycling the Via Francigena from Aulla to Rome, or any of the stages in between, including the most popular section of the Via Francigena in Tuscany. A minimum period of 7 days applies when hiring a bike for cycling the Via Francigena with CaminoWays.com. Your bike: We work with local companies and the bikes are adapted to the terrain and your height (it is essential that you give the reservations team your exact height so you are provided with a suitable bike – particularly if you are cycling the Via Francigena with children). The bike comes with a rear rack, bottle holder and water bottle. Pannier bags: With a bike repair kit inside. The repair kit includes a pump, set of tools, spare inner tube and cables. (*If you don’t need it, just let us know in advance). Bike lock is also included. 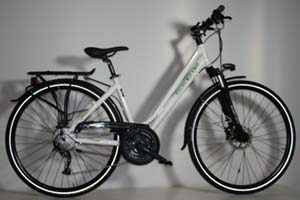 Additional bike accessories can also be hired or purchased, such as helmet, high visibility vest and GPS. You can also bring your own. If you are cycling with kids, let our travel consultants know in advance. We can also provide 20-24″ bikes for kids from 1.20cm in height (from 8 years of age approximately). Our Francigena travel consultants will also be able to give you suggestions for a children-friendly route and itinerary. We have carefully planned the distances you will cover by bike, taking into account the nature of the terrain, type of track and other circumstances (If it’s a path shared with walkers or not, for example). 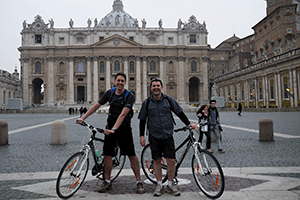 If you feel distances for your Via Francigena cycle are too short or long, talk to our travel consultants when planning your trip. There is probably a good reason behind the mileage chosen, just ask our travel specialists for advice. CaminoWays.com has a 24/7 assistance number should you need assistance and advice (this number is provided with your booking/holiday pack). Our team will be able to give you guidance and, if necessary, our bike rental partners will assist you on the trail. Your bike comes with a repair kit for essential repairs such as flat tyres and punctures. In the unlikely event that you had a second puncture, we can provide you with contact details for the closest bike repair shop (you will be responsible for repair costs). If you are in a remote area and don’t feel like cycling, we can also get you contact details for local taxi drivers (a taxi transfer will be at your own cost). If you feel you need a break from cycling, we might be able to organise a transfer for your bike but we will need 48 hrs notice and there will be a cost associated to the bike transfer (as additional luggage transfer). 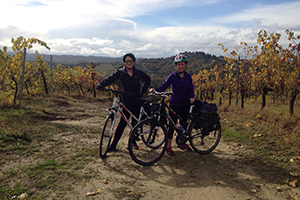 For additional information and advice about cycling the Via Francigena or to book your cycling holiday, contact our Camino travel specialists.